Ready to Level Up your Art Skills? We offer world-class art instruction from industry top performers such as our head artist, Sean Avram. 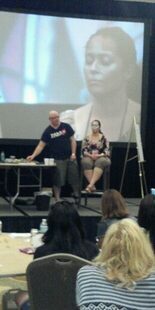 Sean has been teaching the world to face and body paint since 2007. He's been a featured instructor at well-known conventions such as Kapitol Kidvention, Bodyssey, EFABE, and FABAIC. Sean can teach just about anything to just about anyone. He is available for private 1 on 1 workshops, small groups for hands on learning or as a demo, or info session in front of thousands of people. Sean has a lot of training experience under his belt. And a great reputation for being an excellent, funny and kind teacher. He's a positive addition to any convention, guild meeting, trade show. Follow Sean on Facebook to see all the convention fun. 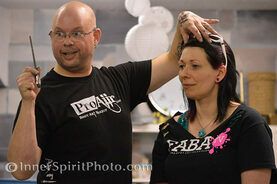 Sean is also a great MC and Public Speaker as well as an experienced face and body paint judge. 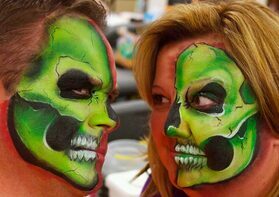 He was on the original cast of SKIN WARS, hosted by Rebecca Romajin. You can also see Sean on FABATV! There are 3 types of workshops that we offer. 1) Regular Convention or Seminar, lecture and demo: This class will have Sean teaching and demonstrating techniques and designs to a large number of people. Participants are encouraged to follow along, if there is room for a small kit at the tables. Sean will speak on a specific topic (determined at booking and will paint a model or volunteers from the audience as he teaches. 2) Private Hands-on Workshop: The lecture and the demo gives you information and demonstrates application. The hands-on difference is that you will be guided by hand, stroke per stroke as Sean teaches you to paint. Sean can custom create a workshop based on your needs or you can choose from our extensive CLASS LIST. 3) 1 on 1 Intensive Coaching Session: We are now offering private 1 on 1 coaching sessions with Sean at The Awesome Shop. People have already started making their pilgrimage to Vermont to spend a day or two with Sean, in his own studio, leading and mentoring you to be the best painter you can be. This workshop has already boosted painters from the USA and Canada to do incredible things such as winning body art competitions, and landing spots on Yogurt commercials.. These coaching sessions are tailor suited to your needs as a painter. Pick his brain, enhance your skill set and grow in a fun, casual environment. If that wasn't enough, Vermont is BEAUTIFUL! There are mountains, forests, ski hills, lakes, light houses museums, ice cream and teddy bear factories to visit and, we live on a lake, seen in this picture. You will leave, inspired, and hungry to utilize your new skills, trade secrets and techniques.